Mazda set a new entry in the Guinness Book of World RecordsTM during the big MAX-5 2013 event on June 15 in Lelystad, Netherlands when a total of 683 Mazda MX-5s joined the procession on the roads around the RDW Test Centre at Lelystad, forming the longest parade of driving Mazdas ever. 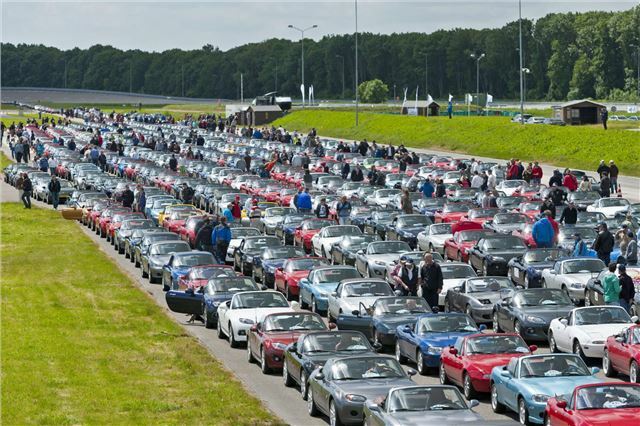 1,450 participants contributed to the record breaking attempt, shattering the existing record for the "largest parade of Mazda cars" - 459 Mazda MX-5s - set in Essen, Germany in 2010. The MX-5 parade through the polder landscape was led by a spectacular version of the MX-5, a third-generation (NC) racing model with the Dutch TV presenter Allard Kalff behind the wheel and President and CEO of Mazda Motor Europe Jeff Guyton beside him. Later on, after the successful record attempt, Guyton also received the official certificate which was presented by Guinness World RecordsTM adjudicator Pravin Patel. Throughout the MAX-5 2013 event, the RDW Test Centre at Lelystad was completely dedicated to the Japanese brand and the Mazda experience. This included demonstrations by the Ribank Mazda MaX5 Cup racers and the three-rotor-engined Mazda3 20B owned by Belgian racing family Van Herck. Participants also had the opportunity of extensively testing Mazda's new i-ACTIVSENSE technology on the banked circuit, or entertaining themselves in one of the racing simulators. All the new Mazda SKYACTIV models were on hand for those interested in taking a test drive and visitors also had the opportunity of a free inspection of their own roadsters. During a special display with some of the finest MX-5s on hand,the award for the most beautiful and authentic Mazda MX-5 of the day was handed over to Pieter Staat from Meteren (NL). The second prize went to Maarten Tuiten from Almelo (NL), followed by Ludo Vander Vliet from Duffel (B), winning third place in this competition. At the end of the day, about 250 cars still present joined to form a large drive-in cinema. Prior to the showing, the viewers were asked to pick from three films and seated at the wheel of their cars, the owners cast their vote by blowing their horn to indicate their preferred film. The loudest ‘vote' was cast for Arbitrage with Richard Gere in the starring role.